The course is primarily a classical Yoga spiritual development course, carefully developed by Swami Vishnu-devananda. This course is meant to be intensive, immersing the students in a day long balanced program of theory and practices. The students come from different backgrounds and cultures and live harmoniously together in a spiritual community under the guidance of teachers. This model is a traditional system of education named “Gurukula” where teachings are transmitted and practiced in daily life. It is not just an academic teaching of techniques, separated from life. 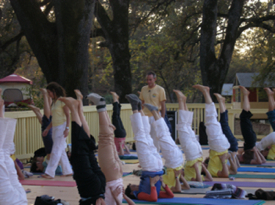 Since 1969, over 24,000 yoga teachers have been trained through the Sivananda Yoga Vedanta Centers’ TTC program. The group energy is very high which adds to the pure atmosphere of an ashram. In keeping with this ancient Yoga tradition, spiritual practices such as daily adherence to discipline, meditation, sanskrit mantra chanting, Hindu gods and goddesses, ceremonial worships such as puja, strict vegetarianism, selfless service and study of philosophy constitute a large part of this program. The cost of the one month TTC/ATTC training course is based on accommodation choice. A $300 deposit is rquired to process the application. The balance is due upon arrival. All payments are non-refundable. Payment may be made by money order, certified cheque, credit card, and PayPal. Visit http://sivananda.org/yogafarm/programs/index.php?prog_id=12 for more information and fill out an application form. This entry was posted in Uncategorized and tagged course, spiritual, teacher, yoga. Bookmark the permalink.